Martin Degville has a new download album out with cover versions of old David Bowie songs. 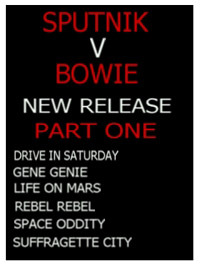 The tracklist is: Drive In Saturday, Gene Genie, Life On Mars, Rebel Rebel, Space Oddity, Suffragette City. The result is very good and all songs are electronic rock'n'roll versions of the old classics with that special Sputnik touch. Lloyd Price has done the programming and he's done a great job. Considering how crappy Bowie's version of Sigue Sigue Sputnik's "Love Missile F1-11" sounded, then it's a pleasure to know that Sputnik has always had a great flair for cover versions of Bowie tracks and Degville still has that touch fully intact. Initially I gave it a 4/6 rating, but having listened to the album many times now in full 320 kbps quality, I've decided to go for 5/6. I really like this EP album. I find it just as good as some of Trent Reznor's (Nine Inch Nails) revamped Bowie tracks. There should be a part II of more Bowie tracks in the works and that is really not a bad idea judging from how well part I turned out. 2 new tracks "Ziggy Ziggy SSStardust" and "SSSpace Oddity (Vocoder Mix)" just added to the "Sputnik vs. Bowie" EP. Martin Degville - G.O.D (guns oil drugs) ♦ Martin Degville - Sputnik 2....The Future ♦ Martin Degville - Space Age Junkie ♦ Martin Degville - The Prophet Of Freak ♦ Sigue Sigue Sputnik Electronik - Futuatronik (EP) ♦ Sigue Sigue Sputnik Electronic - Flaunt It (promo) ♦ Wendy James - I Came Here To Blow Minds ♦ Sigue Sigue Sputnik Electronic - Flaunt It (factory-pressed and mastered) ♦ Sigue Sigue Sputnik Electronic - Electronic DNA ♦ The Montecristos - Born to Rock 'n' Roll ♦ Black Magic Six : "Choose Death"